GSM Flasher FRP Tool is one of the best and revolutionary tools for unlocking FRP. Factory Reset Protection has been implemented by the Google and Android. They start working together on the privacy issue of users Data. And most of the Android Users from across the globe are not familiar with the Factory Reset Protection. At one end the Google and Android are struggling hard for the privacy of the user and at the other end, the people are working to overcome the problem of FRP Bypass. GSM Flasher FRP Lock Remover Pro has been officially developed by the Marm Aung and the tool powered by the GSM Flasher Team. With the Help of GSM Flasher tool, you can easily unlock FRP for all Samsung mobiles with the simple one click the Download Mode, ADB Mode and using Call Dialer. Here, we would like to mention another method of FRP Lock Removal is “SoftBrick Error Fix”. Now if you have any problem with the Samsung Mobile Phone like “SoftBrick Error Problem” you don’t need to flash your mobile. 2 How to Bypass FRP Lock on any Samsung Device? GSM Flasher FRP Pro Tool is one of the exceptional tools which makes the Bypass FRP of Samsung devices simple and super easy. A person with little knowledge can bypass Samsung devices easily. Its offer amazing features which make it unique and standing among other FRP Tools. Here is the GSM Flasher FRP Tool which you will experience once you download GSM Flasher FRP Pro Tool and use it to bypass FRP. Remove FRP Lock of any Samsung Mobile. Actually, FRP of any mobile having android Operating System. Relock FRP of any Android device simply with one click. Reboot devise from ADB Mode to the Download Mode. You can fix the errors like SoftBrick with just one click, no need to flash the whole mobile with any file. You can enable the ADB Mode. You can use GSM Flasher FRP Tool to bypass FRP by using phone Caller methodology. You can make the ADB enabler File Maker with the help of the GSM Flasher Tool. You can bypass FRP in ADB Mode also. You can do the Factory reset on your smartphone device. How to Bypass FRP Lock on any Samsung Device? In the world, more than 40% people are using Samsung Android devices and many of them facing FRP Bypass issue due to lack of knowledge about FRP. Now you can do the task of FRP Bypass on your own. Simply you have to download GSM Flasher FRP Tool and follow the steps mentioned below. The method and tool are not specific to the Samsung devices you can use the GSM Flasher FRP Tool for any other mobile phone like Motorola, LG, and other vendor phones. Here is the complete step by step guide for you to follow. Step 1 – Run the GSM Flasher FRP Tool as administrator. Step 2 – Turn off your Samsung Device properly. Step 3 – You have to press and hold the Volume Down + Home + Power Key at the same time. Step 5 – Press the volume up key in order to continue to “Download Mode”. Step 6 – Now you have to connect your mobile phone to the personal computer or laptop through USB cable. Step 7 – Here you have to click on the ReScan Option and then you have to select your device at USB Modem Comport. Step 8 – Now you have to select your model number and here you have to click on the “Remove FRP” Option. Step 9 – Here you have done the bypass FRP. Enjoy the FRP Unlock. There is a huge difference in the GSM Flasher FRP Standard Tool and GSM Flasher FRP Tool Pro Version. You can avail all locked features and can do maximum activities related to the Bypass FRP Lock. Here we are going to share a complete guide to activate the GSM Flasher FRP Lock Remover Pro and enjoy all features without any restriction. 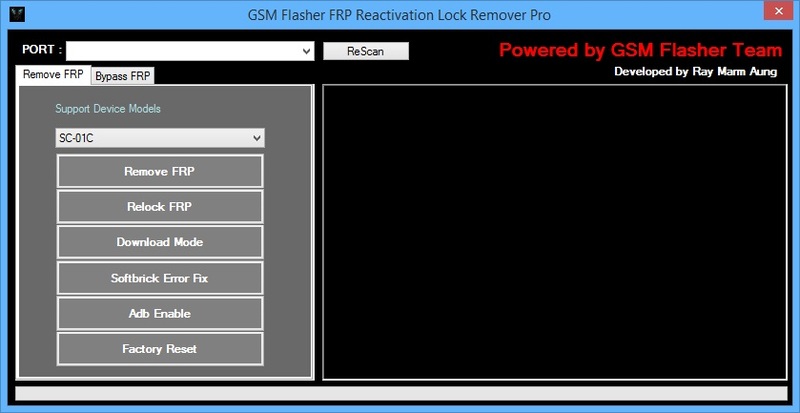 Step 1 – Extract the compressed file of GSM Flasher FRP Reactivation Lock Remover Pro. Step 2- Launch the setup as administrator. Step 3 – Here you have to click on the “Remove FRP”, An activation for this tool has been required and for this, a popup window will appear in which your device ID will be shown like “IAHA-TGNA-NHGU-HIDQ”. Step 4 – Now you have to open the “KeyGen Samsung FRP Tool Pro 2017”. It is a Key Generator Tool. Step 5 – Here you have to type the device ID in the Required Activation Device ID Box “Req ID” and need to clock on the Generate Button. Step 6 – Now you have to copy the activation key & paste in the GSM Flasher FRP Pro Tool and click on the Activate Button. Step 7 – Finally you have activated the GSM Flasher FRP Pro Tool for free. Enjoy the premium features of software for free. Here are the keys which you can use to activate the GSM Flasher FRP Pro Tool to enjoy the premium features of the Tool. AppliactionYak has been working for long to entertain our fans and followers with the sound technical methods related to the FRP Bypass. Today we have unveiled a new method with our fans to bypass FRP. Now you can bypass FRP Lock with the help of GSM Flasher FRP Pro Tool. You can download the GSM Flasher FRP Pro Tool with a simple click on the download link given below. The method is 100% tested and working on all Samsung devices. Share your valuable feedback in the form of comments below. And if the method does not work for you lets us know. Suggestions are welcomed.